The beach sports club, which sits directly on the sea front, has a host of activities, services and events that mean you can learn to paddle surf or play volleyball, then relax by the pool with a delicious cocktail and tasty snack. Of course the big attraction is Flowrider, an artificial, static wave machine, designed in California that can accommodate up to 20 riders at a time. 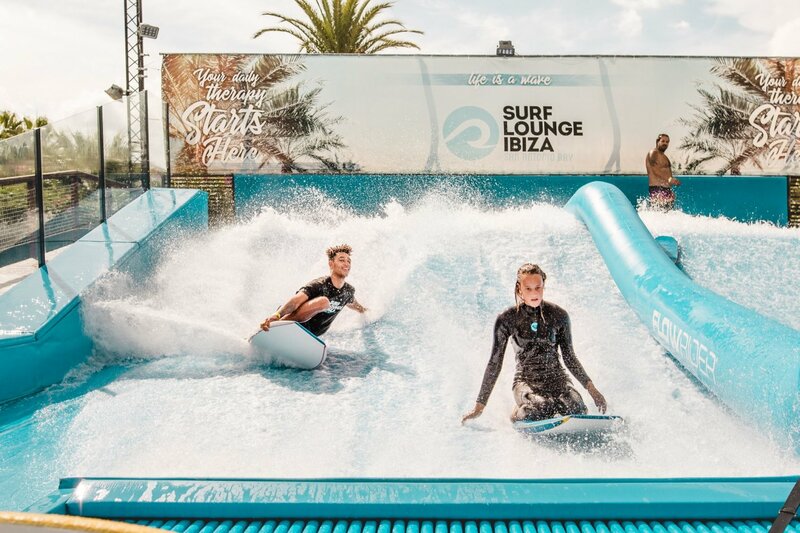 Totally unique to Ibiza, Flowrider offers the opportunity for surfers of all experience levels to enjoy the thrill of riding the waves with monitors and surf teachers in assistance at all times (beginners welcome). Better still is the excellent value you get with all the different ticket options to suit individuals, families and groups. Instructed fun, with all necessary equipment included. Away from the sports, you can relax on the Bali style beds, treat yourself to a massage and sample the ample food and beverage menu. Soak up Ibiza's famous sunset from one of the best spots on the island whilst listening to one of the DJs sunset sessions. Families are warmly welcomed, naturally, and mornings are a popular time for those with young ones. Family tickets are available for 1 adult + 3 children or 2 adults + 2 children. Children have to be aged 12 or under. Definitely one of the most unique activities on the whole island, at a location that offers just about everything else you might want from your sun-kissed trip away. The perfect combination. For more information and to reserve a table for dining at the Surf Lounge Restaurant click here. Note: To guarantee availability in high season, this activity needs to be confirmed with Surf Lounge Ibiza at least 24 hours in advance. You will receive the contact details on your booking voucher. Cancellation policy: If you cancel more than 48 hours before your selected date, you will be fully refunded.